I support the choice of mothers to give birth where and how ever they want. However, that doesn’t mean I think every birth choice should be endorsed by the state, either. There is a victim in poorly made birth choices, and that victim is almost always a baby. Babies deserve legislative protection to make the birth providers that facilitate dangerous practices accountable for their actions. Reckless home birth midwives are the ones who profit from spreading the fiction that home birth, water birth, etc is as safe (or safer) than hospital birth. They are the ones with everything to gain and nothing to lose, and that is why legislation should be aimed at controlling their actions rather than the parents who were duped into hiring an incompetent provider. Indeed parents should be able to choose what happens to their bodies and when, but that does not mean it is moral to legally allow a profession to flourish to facilitate poorly made decisions. Right now any charlatan can call themselves a midwife and boast any safety record they want- there is no way for you to know if they are lying. Even if your midwife is licensed, you would have to trust that any negligence on their part was actually reported to DOPL. There are protocols in place that demand reporting adverse events in hospital births, and there are no such safeguards in home birth or out of hospital births. Home birth midwives who lose babies that could have otherwise been saved are very good at convincing clients (and seemingly, themselves) that the death was not preventable. They don’t have the clinical training to actually know if that is true or not most of the time. It is worth noting that I have never, not once, seen a home birth midwife admit that a baby that died in their care could have lived had they been born in a hospital. This is true even when the baby dies because the time between home and hospital was too long for the baby to endure. They won’t admit wrong and I’ve certainly never seen a home birth midwife that stopped practicing after a preventable death, unless the court ordered them to stop (like with Valerie El Halta and Gloria LeMay). If your midwife loses her license because she hurt people through negligence, guess what? She can just keep on practicing as an unlicensed midwife. She can change her name if needed, and keep doing what she wants to, with full support from the midwifery community. You would never know. Vickie Sorensen, a midwife charged with negligently killing a baby, is going to trial. People familiar with the reported facts of the case would find it to be totally preposterous to dismiss these charges. 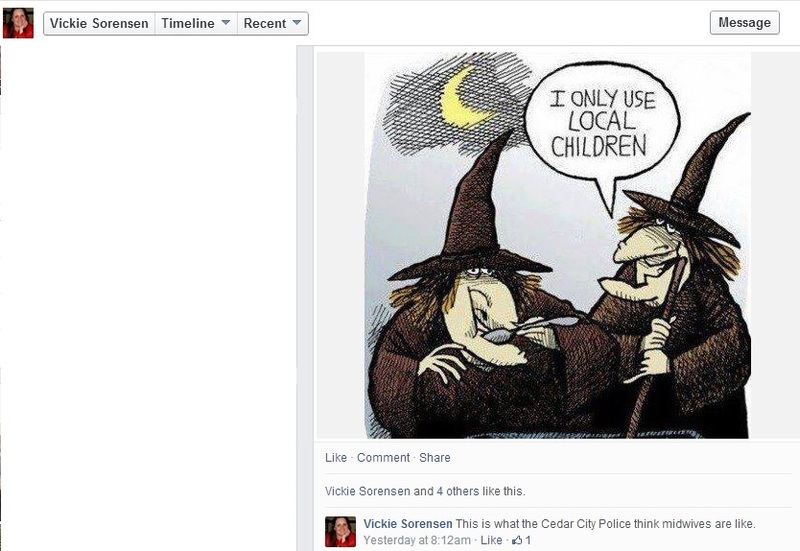 Vickie instead feels entitled to a dismissal on the grounds of “common sense”. None of this has stopped Vickie from delivering babies, by the way. That is because there is nothing in place to stop anyone from delivering babies in the state, even the serially negligent or incompetent. All they have to do is brand themselves a midwife, and legally they are one. It seems like if a midwife is being charged with reckless endangerment and manslaughter in relation to her practice, she should be monitored or sanctioned somehow until the justice system has determined innocence or guilt. This reminds me very much of the Josh Powell case, there was nothing in place to prevent him from visiting his children despite being the prime suspect in the murder of their mother. That lack of legislation cost lives, just like the lack of legislation of midwives in Utah has cost lives. No one involved with the Direct Entry Midwifery Practice Act is willing to be accountable for the lives lost. Not only do they not feel responsible, they don’t even feel sorry. I am currently being threatened with legal action unless I hand over my blogs to a midwife’s attorney, they are demanding that I agree to never speak of them negatively again. They have never actually told me what was wrong on my website (as I am eager to correct any errors), or why they would need access to ex home birthers. They are threatened by someone pointing out the truth about direct entry midwifery in the state of Utah. I will not be bullied into silence. I have the first amendment right to talk about my political beliefs and to lobby for changes to the law in my state. I’m willing to fight this as long as necessary to let parents in Utah know that there are more legal requirements for driving a car than calling yourself a midwife and delivering babies. If anything goes down I will be contacting Ken White of Popehat, who has been extremely effective at finding pro-bono help for bloggers who have been sued to try and curtail freedom of speech. I’m prepared for whatever happens. I read a great article written by Dr. Michael Flanagan, addressing Alabama’s proposed legalizing of direct entry midwifery. He makes several concise arguments about why lay midwives are not adequate birth attendants in emergency situations. Complications of labor can include, but are not limited to, a baby getting stuck in the birth canal, tangling of the umbilical cord around the baby’s neck, bleeding, infection, or even unexpected immaturity of the newborn’s lungs. These dangers are possible even in the most state-of-the-art facility, but at least the infant and mother have the best possible chance of survival. I have personally participated in urgent and emergent care that required quick decisions by the physicians and nurses to save the life of the unborn child and mother. The same cannot be said for a birth that is planned for the home and attended by a lay midwife. Instead, you will have a well-meaning, but woefully undertrained and underprepared individual and a false sense of security for the parents. When a planned home birth takes a turn for the worse, the time spent in an ambulance ride to the ER can mean the difference between life and death. There will always be babies born spontaneously in elevators, taxi cabs and parking lots. Most of these deliveries will likely be fine, given the law of averages. However, if the State of Alabama passes a law legalizing lay midwifery, it sends a message to the public that this practice is safe. This idea could not be farther from the truth. I cannot speak for other states that have unfortunately legalized this dangerous practice. Perhaps no one spoke up against it. Plenty of people speak up against it. Several physicians have spoken to me about the danger of home birth midwifery, the disasters they encounter at their work because of incompetence. A legislator in Utah told me in confidence that they believe most of the legislators in our state would rather not have home birth midwifery allowed legally, but the midwives are very organized and have friends in high places. They are willing to pour as much money as needed into their cause to make it happen- after all, if the practice is outlawed, they are out of a job (or risk prison). They have much more to lose than the average citizen (who will not choose home birth), so they understandably put more effort towards keeping their job legal. Midwives have a weird habit of teaching classes on activism as part of required courses in their midwifery school. They know they desperately need unity to keep the sham going because home birth midwifery cannot stand on its own merits. If anyone from Alabama is reading this- please, please contact your representative and tell them that you don’t want the state to endorse this practice. If citizens of Alabama fail to stop this action you will be in the same position as Utah’s citizens- watching helplessly as tragedy after tragedy unfolds before our eyes, fighting against a status quo of legal unlicensed midwives practicing without any oversight or required training. Every community values its children, and this is a very serious threat to their well being. 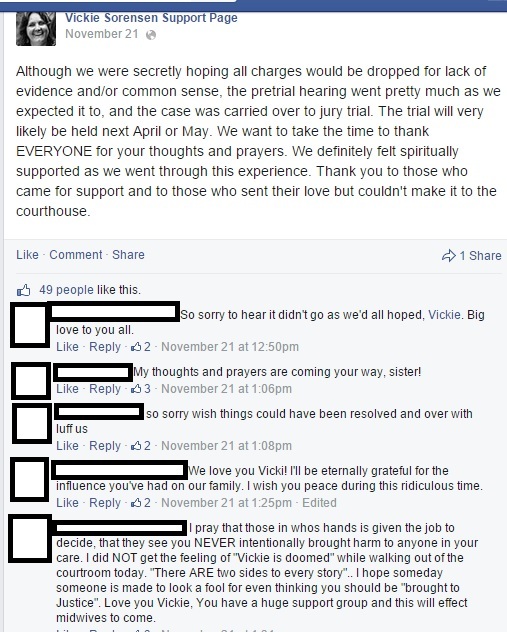 I’ve covered the VIckie Sorensen manslaughter charges extensively before, but I thought readers might be interested in the absolute lack of remorse on vickie’s part for her role in the death of a newborn. 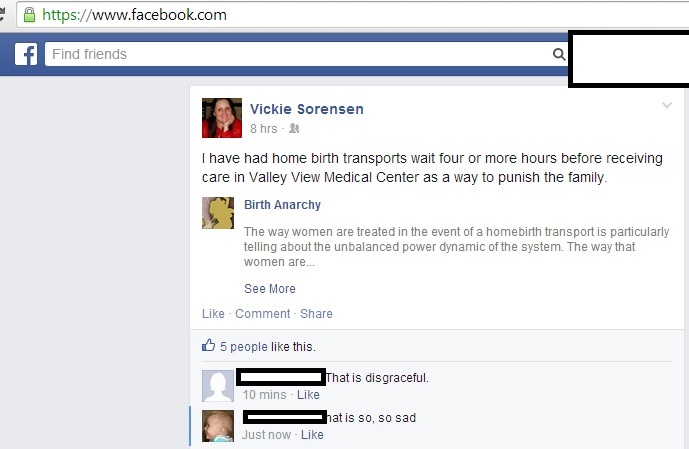 She also made a point of accusing valley view medical center of having a conspiracy against home birth mothers. *The names with asterisks are midwives who have been prosecuted in different states for negligence of various sorts. I’ve linked to the cases on their names, you can click to see for yourself that none of them were exonerated. Most of the other donors are former patients, other birth workers (like birth photographers, doulas, etc), and anonymous donors. 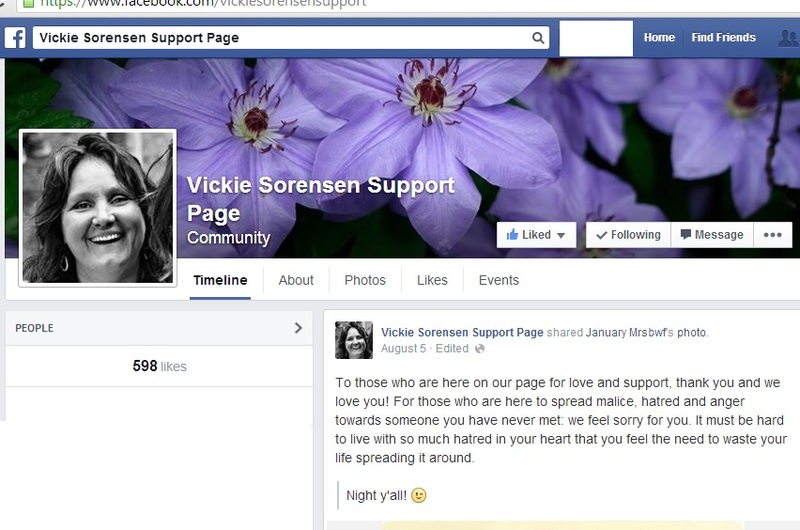 They have managed to post Vickie Sorensen’s bail, and so they raised the gofundme goal to 80,000 (likely for her legal fees). So far I haven’t seen any midwives condemn the laws that allowed this to happen. I’ve only seen them try to put a good face on this and pretend that most midwives follow a reasonable standard of practice, when I’ve pointed out before that most do not. The norm is midwives making up their own rules and their patients remain blissfully unaware of it unless a problem arises. Most Utah midwives, including midwifery school owners, are against vaccinations and are far outside their scope of practice by discouraging vaccination in their patients. The salt lake tribune is the biggest news outlet reporting on the charges against Vickie Sorensen, and their comments section has a few midwives willing to put their name on the line to pretend that legislation would solve nothing in these situations. Tara Workman Tulley, political candidate for city council in Springville, Utah, was among the most vocal in support of keeping things exactly the same as they are now. First she starts with a statement that “most” midwives would transfer this case, and that this is not considered “normal practice” for midwifery care. In reality there is no standard for midwifery care, so this statement is entirely based on her personal opinion of what other midwives would do, rather than any actual data. I get the feeling that Tara will say anything so long as it helps the “cause” of keeping midwives unlegislated. What is particularly alarming is that she only thinks “most” midwives would transfer, rather than “virtually everyone” or “all competent midwives”. This should be alarming to the general public- Tara Tulley runs a midwifery school and trains other midwives. Tara is vice president of the Utah Midwives Association. She started a political committee to respond to the last death caused by negligence, and she clearly felt that it was persecution. Her acceptance of this conduct is deplorable in light of that fact. 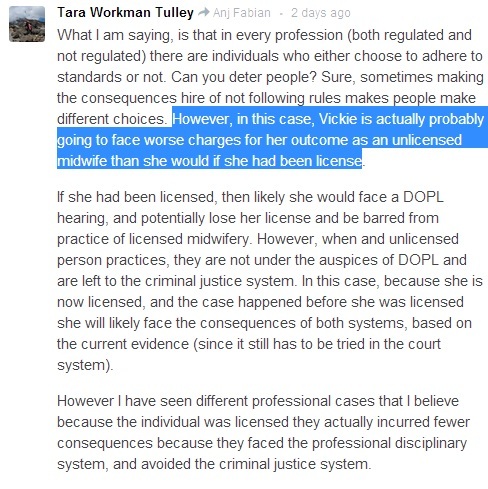 In subsequent posts, Tara Tulley pretends that Vickie Sorensen is worse off as an unlicensed midwife, and therefore not licensing midwives is the rational thing to do. It would be a good argument except for the fact that Vickie Sorensen and other Utah midwives only feel comfortable taking high risk pregnancies like twins, premature, vbac, etc because they have legally done so before, or because they know there is no legal consequence for taking these cases in and of themselves. The legal consequences only emerge when there is clear negligence, like in this case (refusing to call an ambulance, interfering when they did show up, etc). Taking on births that should never reasonably be attended at home is not a legal problem in the state of utah unless the midwife does something else to merit an arrest. It doesn’t matter if the baby lives or dies. Licensing of midwives would prevent this, it would punish them for taking on cases they should not *regardless* of outcome, and insuring of midwives would make sure that even negligent midwives who break the rules would be able to pay for the damages that they have caused. Tara Tulley is against any legislation of midwives. 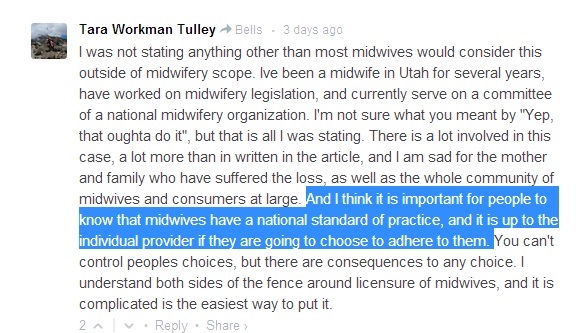 At this point Tara Tulley acknowledged that the standards that are available in direct entry midwifery are entirely voluntary. People can follow them, or not. Throughout the comments on the salt lake tribune she pretends that this is the norm in other medical professions. She conflates other medical professionals breaking the rules as a case for foregoing standards, when in fact it evidences the opposite case. Punishment for deviation from protocols should be swift and harsh as to discourage such behavior. She has stated before that she prefers a mentorship style program to actual legislation aimed at protecting people from clearly negligent midwives. 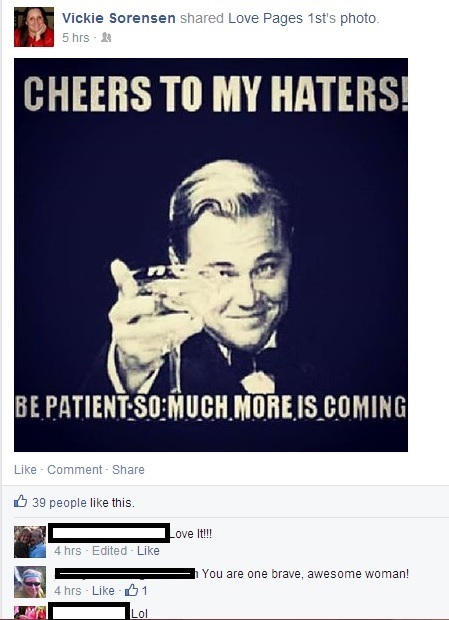 This is her (ridiculous) solution to the problem- mentorship. She calls it ‘responsible inclusion’, but what I call it is using pregnant women as guinea pigs, and then being unable to pay when you damage them. If you don’t know what you are doing, you shouldn’t practice midwifery. Period. No matter how skilled you are you need insurance in case you hurt someone on accident. Its become clear to me that virtually none of the midwives in Utah know what they are doing, and that is probably because there is no central body governing evidence based practices. There desperately needs to be a change in the situation of direct entry midwifery in utah. I’ve contacted the utah midwive’s association for an official statement on the Vickie Sorensen situation. I will update this post if and when they respond (or fail to). Dr Amy Tutuer of the Skeptical OB has a very apt saying about home birth deaths- the babies get buried twice. First in the ground by their parents, and then by the home birth midwives who wish to bury the memory of what happened. It does not have to be that way- take action, call your legislators and let them know that you don’t find it acceptable that its harder to legally drive a car than it is to legally deliver a baby in our state. It may seem like common sense that the law changes after this, that legislators will wake up to the problems with voluntary licensing and voluntary insurance for midwives, but that did not happen last time a horrific home birth death happened in Utah (at the hands of serially negligent midwife Valerie El Halta). The reason nothing changed is that Utah midwives stand up for each other regardless of how heinous their actions might have been. Right now, instead of asking themselves how this could have been allowed to happen or how to prevent it the next time, they are raising funds for Vickie Sorensen’s defense. They are denying reality by trying to say that this is persecution or that there is no merit to any of the charges (we will have to wait and see, but I have yet to see a midwife charged in a case like this that is let free- there are simply too many witnesses in home birth deaths). They also have a leg up because legislators like Holly Richardson support home birth, even after the bill she passed cost a life (now we know its cost many more than that). I brought this to her attention and she ignored me and my concerns. She is running for house district 57 in pleasant grove, and will no doubt push the home birth agenda if she is elected. She is a major reason this state of affairs exists in the first place, but she has washed her hands of all responsibility. You will see that she more or less blames parents for not being diligent enough in checking references, but in both Utah home birth deaths the midwives in question have glowing reviews from a large number of people and professional achievement (El Halta wrote for Midwifery Today, Vickie Sorensen was integral to the original Utah Midwives Association). The Utah Midwives Association (now the Utah Midwives Organization) had a meeting about how to best cover this up and prevent any laws from being passed. The El Halta death happened very shortly before the legislative session opened so no one else was organized enough to change the law. It seems that the lack of action from that death has unfortunately allowed other deadly midwives to operate legally. These babies need you and me to contact everyone we can to try and prevent the next death. 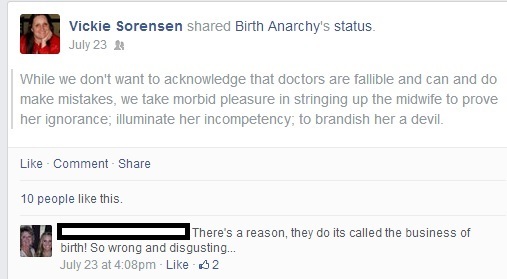 Midwives refuse to police themselves and prefer to have a total lack of supervision or guidelines for their practices. There is actually an official guide for home birth midwives to avoid accountability for deaths they attend, it is called From Calling to Courtroom. You can read it here. You will notice that a lot of what Vickie Sorensen is accused of doing- lying on medical records, interfering with EMTs, etc is encouraged in this book. This is standard operating procedure for home birth midwives. You and I are the only thing standing between negligent midwives and the next preventable death- please help, it will only take a few minutes of your time. You can sign a petition demanding licenses and insurance for midwives here. Does your midwife have blood on her hands?